We live in a time where food production and food trade has completely gone nuts. This is unsettling to many, cause massive harm in the world’s poorest countries, and is a growing cause of the refugee crisis. For example, in Europe we like to eat chicken. For this, the animals are raised in intensive breeding under miserable conditions. More than a third of their food is soybeans. Soy is grown in monoculture for example in Brazil, at the expense of rain forests, then traded at agricultural trade exchanges where speculators cause price bubbles. Originally, chicken had a double use. The females were used as laying hens, the males were fattened for later use of chicken meat. This scheme is now deemed “uneconomical”. Instead, special hybrid races are used either for meat or for eggs, but never for both at the same time. In both cases, only female chicken are of use, the male ones are killed immediately after hatching by gassing or shredding. After a maximally short and intensive fattening, the animals are slaughtered in industrial manner. The price of slaughtering them dictates where they will die, so many animals have to travel far. It is important to note that it does not matter if the chicken has been raised organically or conventionally: both end in the same slaughterhouses under the identical conditions. Except that organic chicken farming may limit the distance to the slaughterhouse. Now, Europeans mostly eat low-fat chicken meat: about 80% of chicken meat sold to consumers in Europe is chicken breast. The animals breeding is optimized for that: this way, the chicken breast makes up approx. a third of the chicken’s whole mass. This “profit maximizing deformity”makes living difficult for the animals but already creates a good profit when selling only the chicken breast. But what to do with the rest of the chicken? It is deep-frozen and exported to African countries. Initially it was sold there for dumping prices, causing a breakdown of domestic markets for chicken. This way, we destroy the economic basis of thousands of families in Africa with our unwanted chicken parts. In addition, most African countries cannot provide guarantee a proper refrigerated supply chain for food. Electricity may be absent for most of the day due to loadshedding, which causes the meat to thaw several times, fully or partially. As an effect, the chicken meat develops heavy mould and pathogens multiply, causing sickness after human consumption. It’s a system that is as sick as it gets. This sounds crazy, but it’s not. In many African countries, chicken grow up completely natural: no factory farming, no industrial slaughter. Which makes them high-quality meat. At the moment, the “breastless chickens” imported as deep-freeze meet from Europe are cheaper than domestic African whole chicken (on an equal mass basis). However, as it has happened in the past, we can expect these prices to rise considerably once the domestic chicken industry in an African country has been driven out of business by these dumping prices. By lucrative, direct export of chicken breast for example into EU countries, African chicken producers are enabled to sell their remaining chicken meat domestically at the same or slightly better prices as the European origin equivalents. In contrast to the European counterparts, this chicken meat will be fresh and without pathogens and would strengthen the market position of African domestic producers. Also with regards to EPA, the upcoming free trade agreement between the EU and African states, such a solution would be the beginning for real export of African goods, under fair conditions without any or with at most one intermediary trader. Due to the mass export of European chicken meat to Africa, suitable deep-freeze containers for transporting chicken meat from Africa to Europe are available at cheap rates. Because currently, they only transport goods in one direction and are shipped back to Europe empty. African citizens urgently need economic successes in order to gain new hope for their future. More and more consumers in (for example) Germany are worried by more and more industrialized animal farming. Why not buy high-quality and naturally raised meat from places where species-appropriate animal husbandry is (still) possible? Our traditional models for development aid have failed, as proven by the stream of refugees from poor African countries. We need a completely new type of international cooperation for economic development! What does it need to establish this new type of trade? Working logistics solutions and an uninterrupted cold chain in African countries. At the same time, this is more than needed for preventing pathogens on important chicken parts. Mobile equipment that allows to guarantee slaughter, packaging, transport and hygiene in a quality that conforms to European norms. A suitable infrastructure for direct sales directly from producer to consumer, or with at most one intermediate trader. Enough consumers to purchase African chicken breast in the minimum amount required for economic transport. Support by politics and decision makers. Of course, this kind of infrastructure is suitable for more than chicken meat. Chicken meat is just an example showing the real opportunity for a regional and international, fair market access for African citizens. If producers offering all their available food products online, it will be simple to get an overview of what food items are available in which amounts, region by region. Missing or undersupplied food items would then be imported or grown locally with assistance from development aid organizations. This amounts to working local supply for food items. In addition, shipment centers for combined regional (and international) shipment can be founded. The proposed African chicken breast and other agricultural products would fetch a high product fairness level in the P2P certification system proposed by Fairdirect. This is due to natural and extensive animal husbandry (easily possible in many African countries), natural grown ingredients for the animal feed, and fair wages paid throughout the production chain. Of course, this result will be an important, trust building sales argument. The basis for this new trade system is the always growing consumer demand for “traditional” and transparent alternatives to anonymously produced industrial food. Consumers are already willing to pay fair prices for fairly produced goods. Fairdirect will guarantee that the product fairness level of such a product is evaluated maximally transparently and neutrally, along the whole production chain and with regular checks. Due to this, it paints a realistic image of the respective producer, even across long distances, and without high certification costs or a special seal of approval. In this way, we can create sales contracts directly between producer and consumer (resp. with one intermediate trader), without speculators and independent of the price volatility of world market prices. 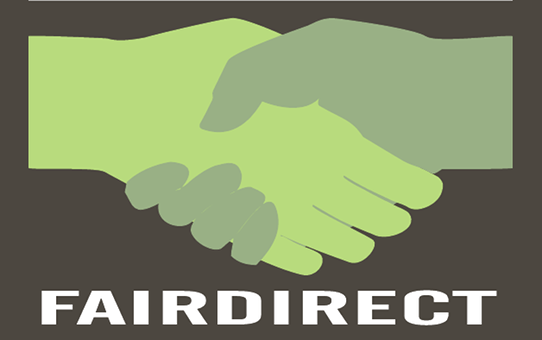 Fairdirect e.V. is willing to contribute to establishing such an infrastructure, anytime.